As soon as Jaxson hears me rustling in the kitchen, he grabs his step stool and rushes in to join me. It might sound like a hassle to let my 3-year-old cook with me, but creating delicious food together equals quality family time. While Sophia is old enough to handle a paring knife or vegetable peeling, I find baking is a great way to get everyone involved. 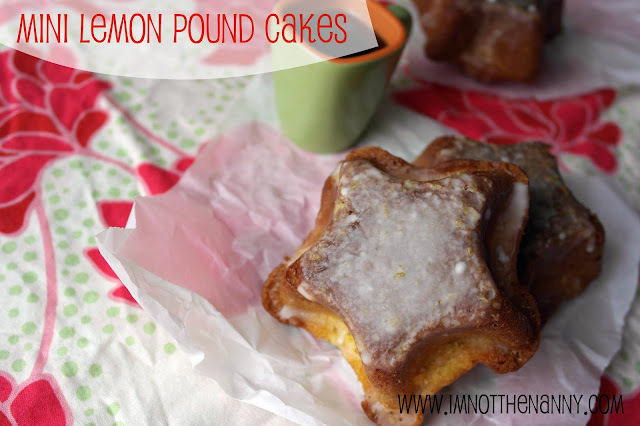 Last week, the kids and I baked mini lemon pound cakes as one last hurrah before school started. Sophia loves the lemon pound cake from Starbucks and I thought it’d be fun to make our own. Earlier this summer, I baked “Mimi’s Lemon Pound Cake” recipe from QVC David Venable’s cookbook, In the Kitchen with David: Comfort Foods That Take You Home, so I already knew it would be tasty. 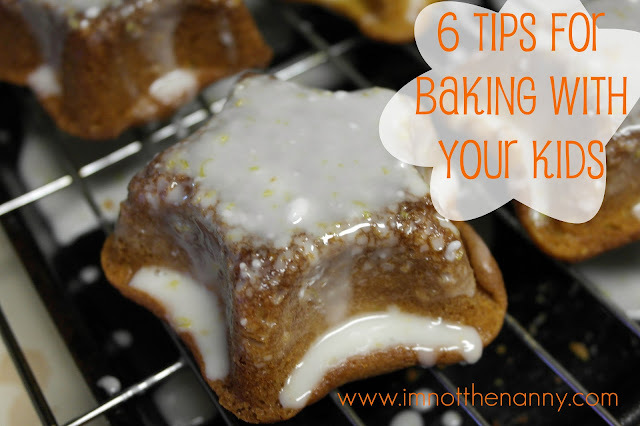 With a little bit of planning, baking with your little ones doesn’t have to be messy or hard. Okay, maybe a little messy. 1. Let your kids pick the recipe. This isn’t as scary as it sounds. Just offer them pre-selected recipes to choose from, like when they were toddlers: “Do you want apple juice or milk?” Just make sure you have the ingredients for the recipe available before you get them all excited about baking. Look at the glee in Jaxson’s face! I love it. 2. Gather all the ingredients and supplies first. You want to be next to your kids to supervise the process instead of rummaging through the pantry to dig out the baking soda or sugar. Before I even crack an egg, I set out all of the ingredients, mixing bowls, measuring cups, etc on the counter. I’ve turned away to grab the vanilla extract and came back to a huge flour-y mess! 3. Teach them math and chemistry. Really. Baking is such a natural way to teach your kids math and science. Preschoolers can count out the cups of flour or sugar needed, while you can explain fractions with the older ones. When creaming butter and sugar together, I explain how the sugar crystal breaks up the butter solids while the mixer introduces air into the mix to make it fluffier. Plus, when they are carefully counting, it helps my kids slow down so they don’t rush and make a mess. 4. Mix it by hand! 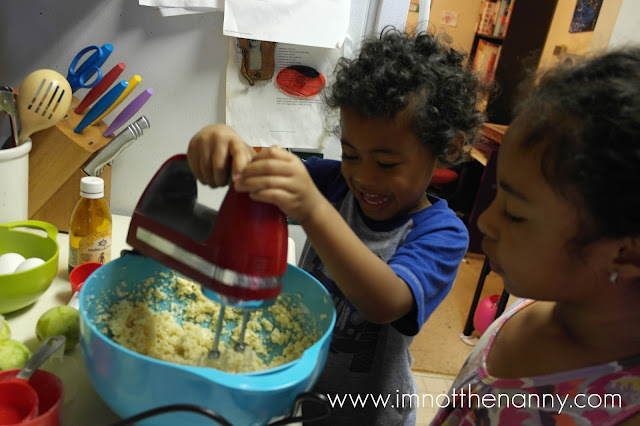 I have a beautiful stand mixer that doesn’t get enough use, but when I bake with my kids, I want to be more hands on. Sometimes we mix the old fashioned way with a spoon or spatula. Other times, I pull out my hand mixer, like this cool digital KitchenAid hand mixer that QVC sent me, and let them take turns. They love feeling the power of the hand mixer! It’s feels like Christmas when they get to lick the bowl and spatulas. 5. Buy kid-sized tools. My kitchen tools are made for adult sized hands so you can make your kids’ job easier by buying cute mini-versions of your favorite whisk, rolling pin, or spatula (affiliate links). When my mom found out how much my kids enjoy baking with me, she bought them their own utensils and made them aprons. 6. Let them lick the bowl. For my kids, licking the bowl is their reward for being good listeners and mixers. My son is so excited about it, he continually asks, “Can I lick the bowl yet? Can I lick the spoon yet?” (Yes, I know all about consuming raw eggs, so you can make the judgement call.) While they quietly “clean” the bowl and spatulas, I do a little clean up. I put away the canisters of flour and sugar, soak measuring cups, etc. Sophia and Jaxson helped me make the glaze for the mini lemon pound cakes. I let them do the (controlled) drizzling once the mini cakes were cool enough. The best part is the taste test. Now that your kids have done most of the work for you, you can sit back and enjoy the results with a cup of coffee or tea. Or sneak an extra piece after they go to bed. Shhh. 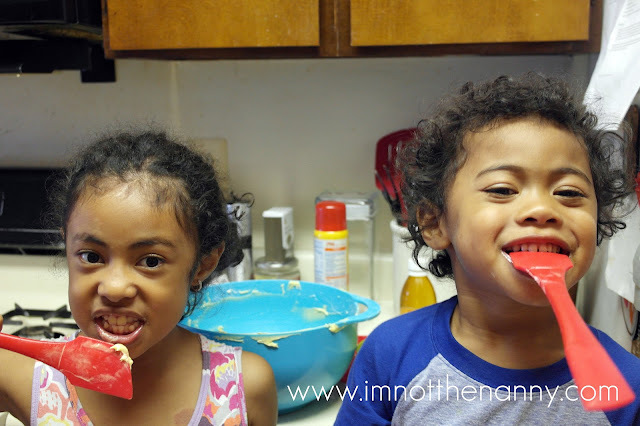 . .
What do you like to bake with your kids? QVC sent me the cookbook and mixer to test out David’s lemon pound cake recipe. YUM! Did you see the chicken enchilada casserole I made from David’s cookbook?